In the 19th century, mathematicians became interested in the question how mathematical functions look like. Felix Klein, a German mathematician, painstakingly created such physical models in his lab in Göttingen and popularized them in America when he brought a boatload to the World's Fair in Chicago in 1893. 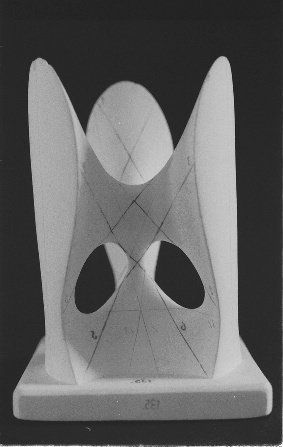 The photo above shows a model of a Clebsch surface from 1880, created by Klein and today kept at the University of Göttingen.